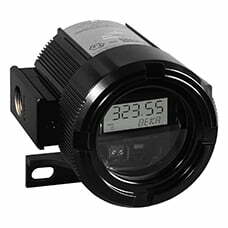 These five-digit explosion proof 4-20mA indicators are available in a choice of epoxy painted aluminum or unpainted stainless steel with FM and ATEX certification, or in stainless steel only with CSA certification. Configuration and calibration is performed via simple Windows® compatible software connected to the instrument by a temporary serial communications cable. A built-in lineariser provides 128 steps for custom curves or precise square root function. Units of measurement can be displayed on a five-digit alphanumerical display below the numerical display. Characters are entered via the configuration software and are remembered by the instrument when the 4/20mA measurement loop is disconnected.